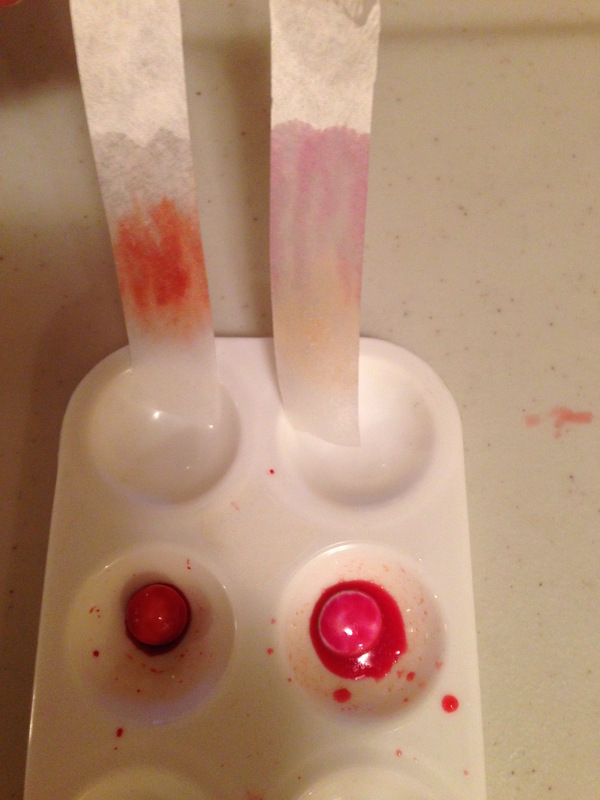 Separate the colours in candy coatings using chromatography, to find out what dyes make up their colour. Add a candy and only a drop of water to a well of the paint tray. Use a stick to turn the candy over and release the colour from its coating. 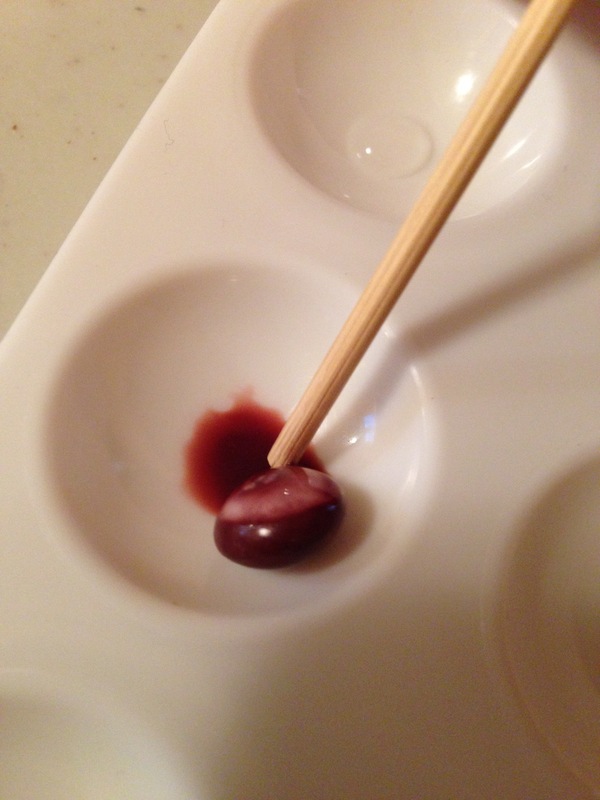 Add one more drop of water if necessary, but keep the colour as concentrated as possible. Cut a strip of filter paper the correct length to hang into the tub from the skewer with a binder clip. It's end should be about 1.5cm above the bottom of the tub. Then remove the filter paper and add 1cm water to the tub. 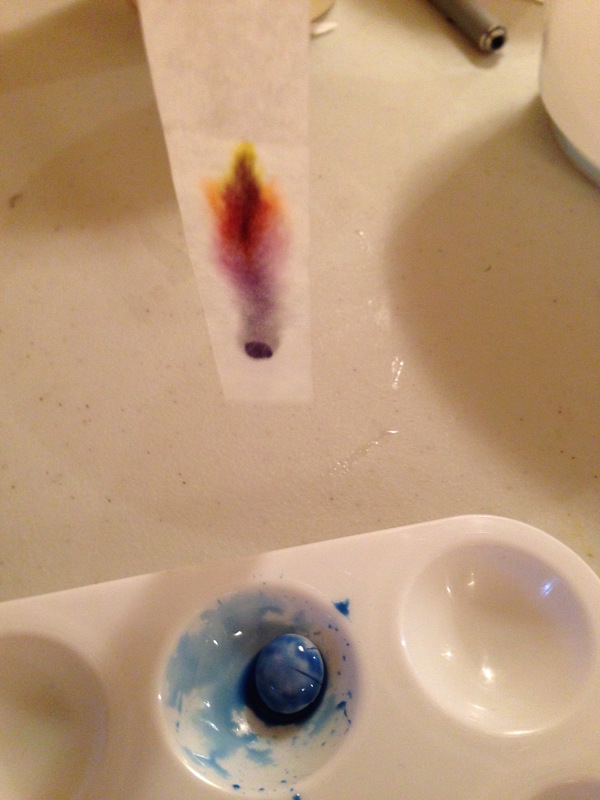 Add a drop of candy dye to the end of the filter paper, at least one cm from the end. Allow it to dry a little, then add another drop, allow to dry, then add another drop. Attach the binder clip to the end of the filter paper strip away from the dye drop. 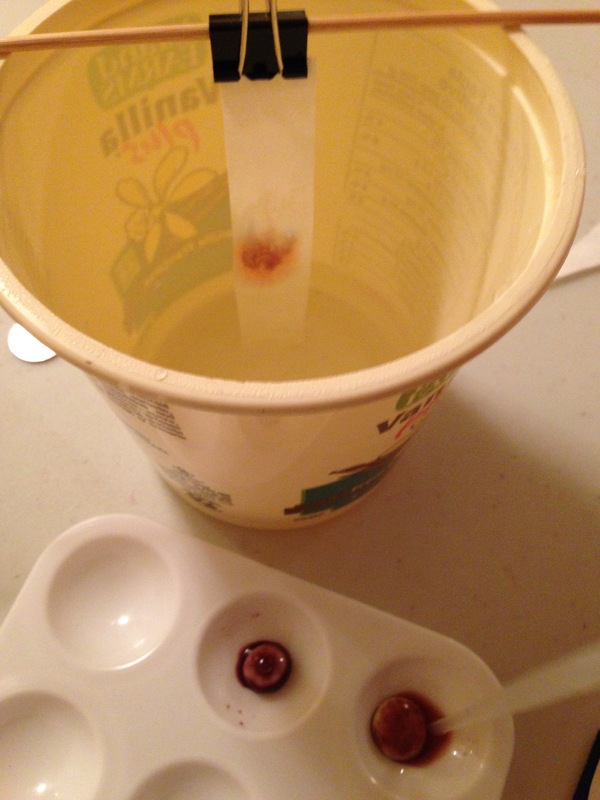 Slide the binder clip onto a skewer and lay the skewer over the top of the tub, so that the filter paper just touches the water, but the spot of dye is not immersed in the water. Allow the chromatogram to run for several minutes, until the colours have moved most of the way up the filter paper. The colours have different abilities to dissolve in water, and attach to the filter paper surface. All the coloured molecules move with the water, then stick on the paper, then move with the water again, but each different colour sticks to the paper or moves with the water to different extents. Hence the colours move at different rates up the paper and are separated out. Try with different coloured candies to find out what colours make up each dye. Compare different candies to see if the same colour is made up of the same component colours.